Topford is focusing on storage media products with 26 years manufacturing experiences and 12 years exporting history. Dating from 1987, Topford started manufactory of 3.5" floppy diskette, which is our initial products in storage line. Till now, we still keep one floppy production line running to meet a certain customers demanding. 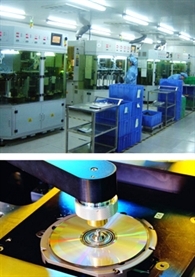 From 2004, we invested the optical disc production line equipped with ODM, 4M & ANWELL, opened our business in blank discs. Up to date, our products covers almost all the range of disc group from 700MB CD-R, DVDR, DL DVD+R, 25GB BD-R to mini CD-R/DVDR, CD-RW, DVDRW and CD/DVD/BD Replication. Monthly output reached 20 million in peak season. international standard. We always guarantee 100% 1 to 1 replacement. Secondly, our professional team in overseas sales, design and logistic can ensure clients import procedure more cost saving and time efficient. LSCD (Philips Licence) can be provided to meet EU countries, North America and some South America countries requirement. Topford has appointed by some worldwide brands like TEAC, GP, XEROX as their preferred manufacturer. Other OEM brands covers all the world market. Besides, we are developing our own brand X-DATA and VIGODATA in Europe and South America market. Topford never stop exploring in new field as disc market turns stabilization. In early of 2013, we set up a new production line for Mobile Power Bank. Based on our rich experience in manufactory and management, we strongly believe we can be an excellent vender in this new field. Welcome to us! Topford is your reliable partner!